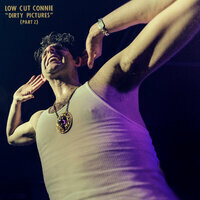 The Philadelphia based Low Cut Connie now release Dirty Pictures (Part 2), the second part of their newest effort continuing the bands rambling style but with a touch more nuance this go around. The group is adept at tickling both highbrow and lowbrow fancies with their piano based rock and roll with ease. For the uninitiated think a more ragged Ben Folds Five who parties with the Scissor Sisters and you have a starting point. Front man/piano player Adam Weiner calls these songs the quieter side to part one but there is enough energy and punch to kick up your heels to them. Opening with "All These Kids Are Way Too High" the group kicks out garage rocker that is surprisingly muted in production and energy never kicking over the amps the way it wants to while "Oh Suzanne" is more of a straight ahead stomping number. The group has clear influence from Elton John and that is on display most directly for "Beverly". It is a swaggering number that takes Sir Elton and gets him prepped for whatever dive bar the band happens to be drinking in. A different direction is the acoustic ditty "Hollywood" which is a straight ahead lyrical success and "One More Time" which successfully combines New Orleans piano rolls, indie rock and gospel all within an engaging lo-fi production, calling to mind a stripped down version of The Oblivians ...Play 9 Songs With Mr. Quintron. Not everything is as successful, "Master Tapes" tries to work up the energy but ends up dull and "Every Time You Turn Around" has excellent backing vocals from Reba Russell and Vicki Loveland but not a whole lot else to get excited about. "Please Do Not Come Home" works better in a pleading desperation vein, but it as well could use a bit of energy injection. "Desegregation" is an interesting rambling number which starts somewhere down in Storyville but ends lost in Memphis and that is where the album was recorded. The group pays homage to Big Star as well closing the record with a winning take on "Hey! Little Child". A fun album which manages to highlight a lesser seen side of the band which will still be living off it's live sets and raucous energy. We see the influence of some famous singers on the work of this genre. However, this gives the album a certain zest and a contrast.